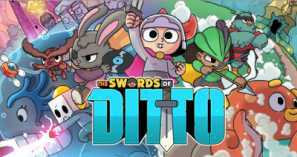 On paper, The Swords of Ditto is a very appealing concept to me. A hack'n'slash, dungeon crawling rogue-like with various buffs and events with every play through; it seemingly coupled two games that I've been very fond of in the last few years: The Binding of Isaac and Secrets of Grindea. All with a charming visual style over everything. However, at the time of writing with about ten hours spent with the game, I'm at my wits' end and have no desire to revisit the game. The world has a constant curse bestowed upon it, that of Mormo. The evil witch will rise every one-hundred years to swarm the land with her curses and monsters. In combat to this, the Sword of Ditto is risen – a chosen child every hundred years to challenge and try to defeat the witch. If successful, the land will know peace for the next century, if defeated the land would whither, the buildings would become more dilapidated. 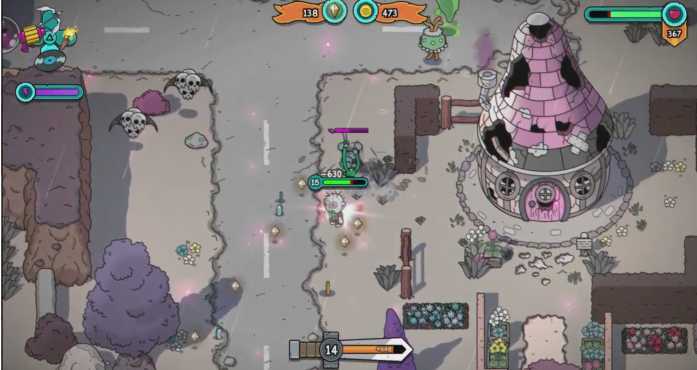 You are given four in-game days – usually around two hours - to work your way through the procedurally generated world, building up your supplies and gaining toys/stickers to make yourself more powerful. 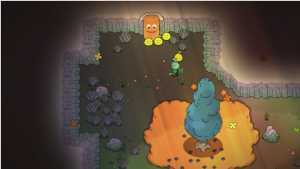 There are four main dungeons, two with toys – essentially new weapons or tools – and two with pillars. 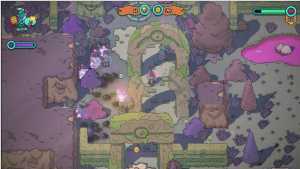 Mormo draws some of her strength from these pillars and defeating them weakens her for the final fight. All of this sounds promising, but there were very few occasions where I had any fun at all with the game. Technical issues aside for now, the pacing and some of the development decisions really hold the game back. You gain XP for defeating enemies and completing side-quests. 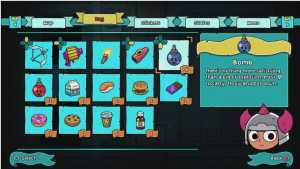 The side-quests are procedurally generated as well, and are mostly a chore. I've had 'collect 11 toilet rolls', 'defeat 27 enemies' to none at all. The 'defeat X number of enemies' quests were the most desirable, as you're doing that anyway, but the random enemy drop quests seemed unfair and unmanageable with the game's time limit. The biggest problem with all this is that levelling up is almost entirely pointless. 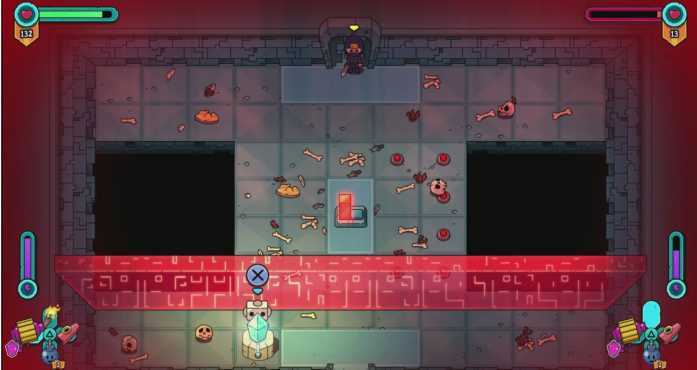 If you die on a run, everything in the next run will be a level higher. For example: dying at a level 5 dungeon (which you've spent a considerable amount of time grinding to be able to enter in the first place), will now be a level 6 dungeon. This is so frustrating, and a needless attempt to prolong the game's experience. It feels a disservice to your character's progressions. Especially if you die early into a run have have to grind again just be able to start the game proper. The fighting system is very simplistic. You have a three hit sword combo and a roll, no blocking. Enemies become rather easy to beat once you get the hang of their attack pattens and the sword/roll cancelling to get the hits in. Gameplay differs in the dungeons. While there are still enemies to attack, there are considerably more puzzles. These were very hit-and-miss. I've witnessed numerous rooms (including the penultimate room before the boss) where the puzzle was to just hit a switch in front of the door which opens said door. There are areas of these rooms which just don't work, or make sense. This is where the procedural generation doesn't work well. So, the grinding isn't fun, the dungeons aren't interesting and the progression is immensely frustrating. Where I did enjoy the game, albeit for a short amount of time, was discovering smaller random dungeons across the world. Time stands still in dungeons so I didn't need to worry about these, and you got a good amount of money and stickers from them. Stickers offer buffs to your character – more health during day/night, higher defence, roll forever etc – and are mainly helpful. I started feeling that my character was getting stronger and I'd have a better chance. However, at this point I didn't realise there were four main dungeons and ran out of time, only to be defeated by a swarm of enemies in Mormo's castle. For a rogue-like, The Swords of Ditto has a lot of fluff. When playing through the game numerous times, a quick restart is helpful. At the start of each play through you have to read the same needless dialogue, run your character over to the sword and become Ditto. It's just tedious. It was even worse after I'd defeated Mormo on a run and started the next. It took a good ten minutes before I was able to take full control just start the game over. I'd hoped for some changes (think of what's in Binding of Isaac after you defeat Mom's Heart for the first time) but apart from some uplifting cosmetic differences, it was the same. My play throughs were wrought with technical issues throughout, on both single player and co-op. I've had the fast-travel bus not load properly (instead lots of white squares) and take over five minutes to load into the next screen, characters getting stuck, items that I've paid to carry over to the next run not appearing, invisible walls where there really shouldn't have been, all my money disappearing when I've saved during a play and come back later and my character changing completely. Some of these aren't much of an inconvenience but others are really problematic. I finally beat Mormo (the final battle is uncharacteristically easy; its the six-floored dungeon leading to her where I fell most often), after destroying one pillar. I was fairly lucky, as one of the dungeon conditions was that my sword did double damage. I loaded the game up again, was disappointed with the beginnings of the next run, and don't feel like playing it anymore. Bizarelly, I found the game to be more fun in single player, rather than co-op. 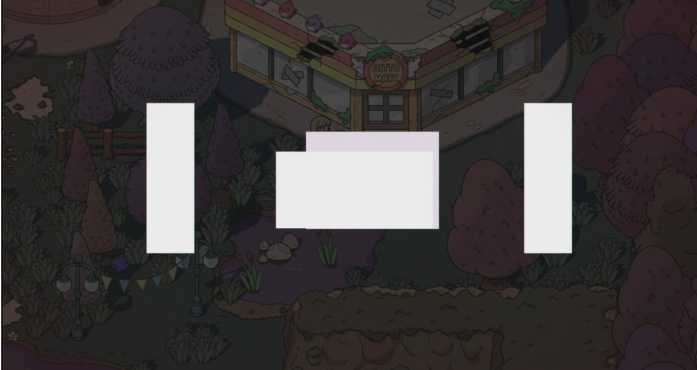 I was really looking forward to The Swords of Ditto and have tried by best to get on with it, but I just can't. It's a massive disappointment and full of bugs and unfair mechanics, leaving each two hour play through a slog. The lovely visuals and audio design can carry it for a while but ultimately, I just cannot recommend this game as it currently is.